Grassform supplies a wide range of ground protection mats & boards, as well as ground support panels – from man-handleable mats to heavy-duty Tufftrak panels. Our range is tough, durable, hardwearing, made from recycled plastic and recyclable at end of life so whether it be for pedestrian access or a 1000 ton crane we can find a solution to fit your individual project requirements. If you need a quote or technical advice, call to speak to one of our experienced sales staff who will be happy to assist. From temporary trackways for pedestrians to heavy-duty ground support for large vehicles and machinery, Grassform supplies a wide range of versatile ground protection boards suitable for every purpose. From lightweight mats that can be easily installed and moved by hand to industrial-strength Tufftrak panels, our range is practical, flexible and durable. 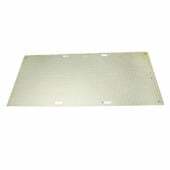 Ground protection boards and mats serve a dual purpose. When you need to let vehicles pass over soft ground, whether it is for car parking at an outdoor event or giving heavy machinery access to a construction site, boards and matting prevent cars and plant getting bogged down or stuck in mud. At the same time, plastic boards and matting protect the ground from damage, too. If, for example, you hold an event at a public park or sports ground, temporary trackways built out of interlocking PVC boards will stop lawns and surfaces being damaged by pedestrians and vehicles passing over them. Whatever your requirements, whether you are looking to build temporary roadways and pathways to provide vehicle and pedestrian access to an event, or whether you need excavator mats to support diggers and plant machinery on a construction site, we will find the right solution for your individual project. Even if you need to support a 1000-tonne crane on damp and boggy ground, don’t worry – with more than a decade of expertise to draw on and a fantastic product range, we have even the toughest challenges covered. 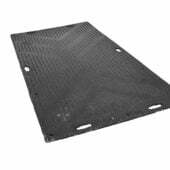 All of our ground protection mats and boards are manufactured from eco-friendly recycled plastic. As part of our commitment to environmental protection and sustainable solutions, we only source products that are made from recovered industrial plastics. All of our mats and boards can also be recycled again at the end of their life, making sure none of the products we sell and hire end up in landfill. We are proud to supply some of the most respected brands in the temporary trackway and ground protection mat business. All of the manufacturers we work with specialise in tough, durable, weather resistant modular boards with innovative grip and anti-slip systems for safe use in all conditions. Lightweight, easy to assemble yet tough and hard-wearing, Euromats are the perfect ground protection solution for access routes, temporary car parks and pedestrian walkways. On a relatively firm surface, Euromats can withstand loads of up to 30 tonnes, making them more than suitable for temporary roadways handling traffic from cars, vans and small buses. A great alternative to heavy steel bog mats and slippery plywood boards, Euromats have a unique construction which ensures the underside of the mat grips to whatever surface it is placed on, while mud is dispersed from the top surface. This safety-first design ensures neither the mats nor the people walking on them slip. Protect people, property and the environment by using Euromats at your next event. Another lightweight and versatile solution, Trakmats are ideal for industrial outdoor flooring and temporary access routes. One of the key features of Trakmats is that they are a light grey/green in colour, unlike the usual black of other ground protection mat brands. This means Trakmats absorb less heat and UV radiation from the sun, which ensures less damage is done to the grass underneath each mat. So if you really want to prioritise protection of a lawn or sensitive grassed area, Trakmats are ideal. 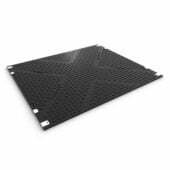 Trakmats are simple to assemble and on good surfaces can take loads of up to 30 tonnes. They are slip-resistant in all weather conditions and will provide support and grip on even the boggiest ground. Tufftrak is the ultimate heavy-duty support solution for construction vehicles, plant machinery and cranes. With a maximum load of 150 tonnes per board, super durable high density polyethylene Tufftrak boards are ideal for constructing temporary trackways and roadways for heavy vehicles, or for using as excavator mats to support heavy machinery. With a unique chevron surface design, Tufftrak provides outstanding grip in even the muddiest of conditions, eliminating the risk of sideways slip. Efficient weight distribution ensures Tufftrak can be used securely on even the wettest, boggiest ground, and will protect surfaces in sensitive areas from heavy rutting and damage. In addition, Tufftrak is chemically inert, so can be used with peace of mind in any location without risk of contaminating the ground. Euromats and Trakmats are light enough to handle and straightforward enough for self-installation. 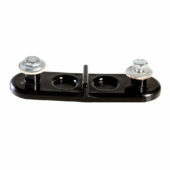 We provide a range of options for joining the modular boards together – urethane connectors for standard installation, metal connectors if the mats are to be traversed by vehicles or tracked equipment, and U pins for fixing to sloping soft ground. For heavier duty Tufftrak boards, we provide a full installation service.